Matthew Barney: Redoubt is Barney’s first solo museum exhibition in the U.S. since the presen­tation of River of Fundament at the Museum of Contemporary Art, Los Angeles, in 2015–16. The new artworks in Redoubt continue the artist’s notable shift in materials over the past decade, from the plastic and petroleum jelly of his early works to the cast metals that figured prominently in River of Fundament. With Redoubt, Barney has combined traditional casting methods and new digital technologies with unprecedented techniques to create artworks of formal and material complexity as well as narrative density. The four monumental sculptures in the exhibition, for instance, derive from trees harvested from a burned forest in the Sawtooth Mountains. Molten copper and brass were poured through the trees, creating a unique cast of the core as the metal flowed inside. Each sculpture is a literal vestige of Idaho, with the remains of the tree being subsumed into the artwork. The exhibition also includes engravings on copper plate that Barney made during the filming of Redoubt as well as a series of electroplated copper reliefs that feature imagery from the film, such as the landscape of the Sawtooth Mountains or a wolf among the trees. The electroplates were made using a technique that Barney developed during production of the film, which he then refined and expanded in the studio. In this experimental method, an image was engraved into a copper plate coated with asphalt. The plate was immersed in an acid and copper solution and was subjected to an electrical current, causing copper growths to form out of the engraved lines. By altering the condi­tions in the electroplating tank—including current, heat, and chemical concentrations—the artist produced unique variations on each image. 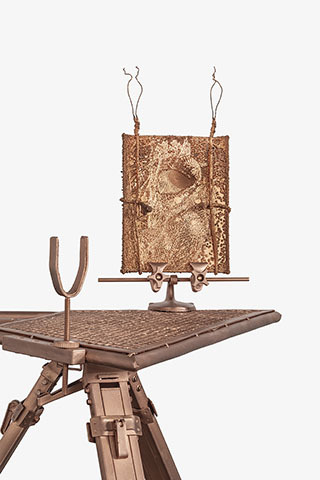 On the plates that were left longest in the electroplating bath, the copper accretions overtake the drawing, transforming the engravings into abstract reliefs and almost completely obscuring the image. Redoubt was filmed in Idaho’s rugged Sawtooth Mountains and continues Barney’s long-standing preoccupation with landscape as both a setting and subject in his films. By layering classical, cosmological, and American myths about humanity’s place in the natural world, Redoubt forms a complex portrait of the central Idaho region. Like most of Barney’s previous films, Redoubt is without dialogue; but in a marked shift, Barney has more fully incorporated dance into the narrative of the film, allowing the characters to communicate choreographically. Throughout the film, the characters’ movements are formalized into choreographies that echo, foreshadow, and interpret their encounters with wildlife. Eleanor Bauer, who also worked with Barney on River of Fundament, both performed in and choreographed Redoubt, in collaboration with K. J. Holmes, Sandra Lamouche, and Laura Stokes. All of the dance passages were filmed on location, and the relationship between site and movement is a recurring theme. Structured as a series of six hunts that unfold over seven days and nights, Redoubt loosely adapts the myth of Diana, goddess of the hunt, and Actaeon, a hunter who accidentally trespasses on her and is punished. The Diana of Redoubt (Anette Wachter) is both the protector of the natural world and a predator in it—a present-day sharpshooter in the frigid Idaho wilderness. Accompanied by her attendants, the Calling Virgin (Eleanor Bauer) and the Tracking Virgin (Laura Stokes), Diana traverses the mountainous terrain in pursuit of the elusive wolf. 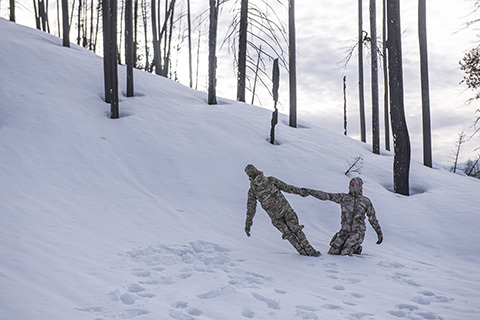 The Engraver (Matthew Barney) happens upon the hunting outfit in the forest and begins stalking the trio, furtively documenting their actions in a series of copper engravings. He brings his plates to a remote trailer housing a rudimentary laboratory, where the Electroplater (K. J. Holmes) subjects them to an electrochemical transformation. In a pivotal scene near the end of the film, the Engraver encounters a sixth character, the Hoop Dancer (Sandra Lamouche, Bigstone Cree Nation), who rehearses a Native American dance in a nearby town. Her complex movement sequence unites her with the other characters across time and space, as the film progresses to a climactic moment of cosmic and terrestrial reversal. Having spent little time at Yale since he was an undergraduate, Barney made several trips to campus while working on Redoubt. During these visits, he explored the Payne Whitney Gymnasium to find the site of a seminal performance piece he did while a student; studied American landscape paintings in the Gallery’s collection; toured the celebrated architecture of the Beinecke Rare Book and Manuscript Library and the ruins of New Haven’s Winchester Arms Factory; delved into the collections of the Yale Peabody Museum of Natural History; and discussed topics ranging from the art-historical landscape tradition to metallurgy to wolves with both curators and faculty. The related catalogue, which will be published by the Gallery and distributed by Yale University Press, is a comprehensive representation of the project, using hundreds of stills and documentary photographs to track the film’s narrative. The publication also features lush images of the engravings, electroplated copper plates, and tree sculptures related to the project, as well as other images that inspired Redoubt. The volume is organized into six chapters mirroring the “hunt” structure of the film. Included are an introduction, a historical essay originally published in National Geographic in 1899 that discusses the relationship among forests, forest fires, and regrowth, and six essays—some lyrical, others more objective—that approach Redoubt through the disciplinary lenses of art history, ecology, and dance theory. Taking a cue from Redoubt’s mountainous setting, the overall design of the book evokes a field guide. Exhibition made possible by the Janet and Simeon Braguin Fund and the Robert Lehman, B.A. 1913, Endowment Fund. Organized by Pamela Franks, Class of 1956 Director, Williams College Museum of Art, Williamstown, Massachusetts, and former Senior Deputy Director and Seymour H. Knox, Jr., Curator of Modern and Contemporary Art, Yale University Art Gallery. All hunting scenes in Redoubt were staged using special effects. Trained animals were provided by professional handlers, who monitored their safety and the conditions on set. Wild animals were filmed in their natural habitats.